This is a very interesting cake. 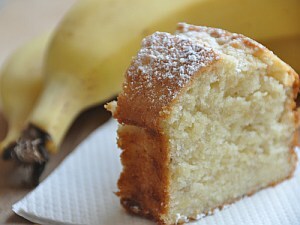 Have you ever tried to make a Banana Yogurt Cake? I know there are a lot of ingredients and instructions but this is not bad to make at all. Cream butter in a large mixing bowl at medium speed of an electric mixer. Add eggs, one at a time, beating well after each addition. Add banana; beat well. Combine flour, baking powder, soda and salt in a medium bowl. Add flour mixture to cream mixture alternately with yogurt, beginning and ending with flour mixture. Mix after each addition. Stir in pecans and vanilla. Pour batter into 2 greased and floured 9″ round cake pans. Sprinkle 1/2 c coconut evenly over batter in each cake pan. Bake at 350 degrees for 30 to 35 minutes. Let cake layers cool in pans for 10 minutes. Carefully remove cake layers from pans and let cool completely on wire racks. Place one cake layer, coconut side down, on a serving plate. Brush with Banana Flavored Syrup on top. Spread top cake layer with Creamy Nut Filling. Top remaining layer coconut side up. Spread White Snow Frosting on sides and 1″ around top edge of cake, leaving center unfrosted. Combine water and sugar in a saucepan, bring to a boil and let simmer until sugar dissolves. Cool and add creme de banana. Combine sugar, flour, salt, half-and-half and butter in a small saucepan. Cook over medium heat, stirring constantly, until mixture is thick and creamy. Remove saucepan from heat, and stir in chopped pecans and vanilla. Combine shortening, butter, egg white and extracts in a medium mixing bowl. Beat at medium speed of an electric mixer until blended. Gradually add sifted sugar to cream mixture, beating at medium speed until frosting reaches spreading consistency.